Military cable assemblies must withstand constant use in variable climates and harsh conditions. In many ways, custom military cable assemblies have the same basic requirements as cable assemblies for other industries: They must carry power or information from one place to another. The difference with military assemblies is that they are often required to perform in much harsher environments, and it is even more critical than commercial products that they do not fail. Because of this, military cable assemblies are subject to exacting standards that are crucial for a wire and harness manufacturer to meet. As previously stated, with military cable assemblies failure is not an option. In many cases, equipment is mobile and meant to be deployed rapidly in combat situations. This means military cable assemblies must be able to withstand extreme temperatures and conditions with heavy shocks, vibration, dust, and moisture. When designing these cables, it’s essential to keep all of these considerations top of mind. Producing a cable that is designed to the optimal flexural requirements can ensure it is sturdy enough to withstand the frequent stretching, twisting, and contracting of heavy use. Depending on the specific requirements of the machinery, Meridian’s engineer may recommend a coiled cord or stranded cores in the individual wires to enhance the cable’s flexibility. Beyond the stresses that come with continual use are environmental considerations that range from larger issues like temperature and climate to more immediate concerns like vibration of the equipment. We are able to design military cable assemblies that address the most challenging conditions using a wide range of techniques, such as tooling to create strain reliefs and overmolded connectors that withstand harsh environments. Whether securing communications to field units or powering bases overseas, each branch of the military uses cabling and wiring that must be tailored to their specific applications. Sometimes, a cable must be ever more versatile. 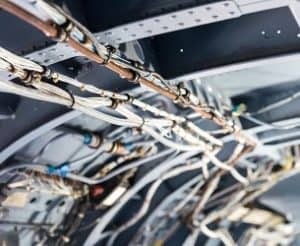 For example, the complex wiring of an airplane can require cables that must reach from one end of the plane to the other, encountering different areas with different conditions along its path. When producing custom military assemblies, it is important to work with a cable and wire manufacturer that understands the importance of following specifications and requirements meticulously. Meridian Cable always strives to maintain the highest quality product while meeting the exacting standards of military specifications. From design through production, our team is committed to adhering exactly to specs and maintaining open communication to address any issues as they arise. The engineers at Meridian Cable have valuable experience producing customized military cable assemblies that meet requirements for quality and durability. We work with a wide range of materials and are able to provide solutions for a variety of applications. Please contact us if you have any questions or would like to discuss what we can do for you. ← Why use a molded cable assembly?